There is nothing as filling as a big vegetable buddha bowl. The robust compilation of vegetables makes it perfect to put together on the weekend, so if you get busy during the week, you have no excuse not to indulge in something healthy and delicious. 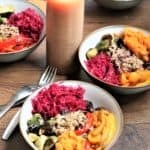 This combination bowl has sweet potatoes, cabbage, mushrooms, tomatoes, rice/quinoa, red and yellow peppers and brussel sprouts. 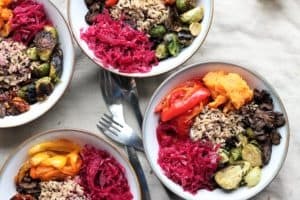 If you don’t have these exact ingredients, don’t worry– delicious, beautiful and healthy bowls can be created with any vegetables that you have in your refrigerator. Mushrooms are fat-free, cholesterol-free, gluten-free, low in calories and sodium, yet provide the powerful nutrients potassium, selenium, and riboflavin. Mushrooms are a good source of vitamin B and D, along with essential antioxidants and minerals. Quinoa is whole grain and gluten-free that contains all nine essential amino acids and a complete protein food that is high in antioxidants. Filled with essential fiber, vitamins B and E, calcium, potassium, iron, and minerals, it helps regulate the digestive system. Quinoa comprises a healthy dose of fatty acids that are considered to be heart-healthy. Red cabbage contains polyphenols or compounds that offer antioxidant, anti-inflammatory and anti-cancer benefits. It is high in fiber, low in calories, rich in beta-carotene, and vitamins A, C and K. Red cabbage is a perfect immunity-booster. A cruciferous vegetable, brussels sprouts are high in protein, Vitamins C and K, but low in calories. Sweet potato. Sweet potatoes are high in beta-carotene and fiber as well as an excellent source of vitamin A, C, manganese, copper, pantothenic acid and vitamin B6. Additionally, they are a good source of potassium, dietary fiber, niacin, vitamin B1, vitamin B2 and phosphorus. 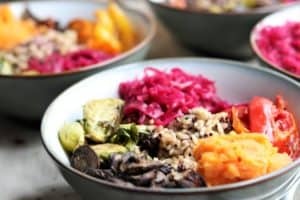 Super Large Buddha Bowl packed with nutrition. Using large baking pan, drizzle olive oil and salt and pepper on mushrooms, red/yellow peppers, mushrooms and Brussel sprouts. Wash and pierce sweet potato and bake in oven with vegetables. 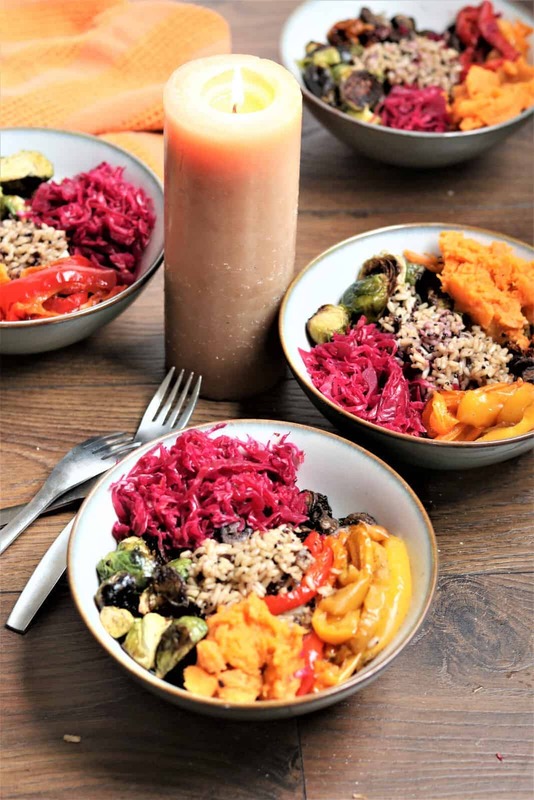 Build your bowl by adding mushrooms, peppers, cabbage, sun dried tomatoes, quinoa/rice, brussel sprouts.